Really nothing that exciting today. Ups and downs. I am embarrassed about the downs. Let's see...Dalton had spent the night at a friend's home last night, and the second I see him this afternoon he complains to me that he is bored because now he has nothing to do. Why does that get under my skin? So, my reaction is to tell him that if he is bored he can clean up the downstairs play room. He blows a gasket. Starts crying/moaning/convulsing as he walks down the stairs. I hear "I hate my Mom" in there somewhere. I tell him that I understand that he is trying to send me a message that he hates cleaning. But the message that I am hearing is that we need to work this muscle. I tell him that the reason why it is so painful for him to clean, is because he doesn't do it. Like a puny muscle quivering when you try to lift a weight for the first time. But every time you lift that weight, the muscle gets stronger, until it is easy for the muscle. It seemed to make sense to him. He began to pick stuff up, but still with moans and groans. So I told him that he would need to do it with a good attitude, or his work would double. I guess that Gavin came in a bit later, and so Dalton gave him a good show about the pain and agony that had been forced upon him by M.O.M. (mean-old-mom) to which Gavin's bleeding heart responded by asking Dalton if he could help him clean. Well, how could Dalton refuse???!!! So, I come down a minute later and see Gavin doing all the work. They both looked like they'd been caught with their hand in the cookie jar. Gavin ducked in to the bathroom, saying he needed to jump in the shower. After a time-out, I told Dalton that he needed to ask before he assigned his chores to others. That sometimes grown-ups could help, but it wouldn't help his cleaning muscle get any bigger if someone else was doing all the work (actually I didn't use that analogy...wish I would have- dang! )..but something like that. So Dalton finished the cleaning by himself and Gavin and I had a talk about being on the same team. Us talking, made Dalton nervous, and he came up to check out what we were talking about. Sweet little guy...hates any thing but good vibes, and who can blame him. Dalton was sent back downstairs, where the conversation between Gav and I digressed. He already felt bad, because I had made him feel bad earlier. It was about an old-yard-sale-outdoor-rocker that I'd purchased last year, intending to fix up like some Martha Stewart-wanna-be, but never had, that he'd put out for trash. I admit that it is trash, but I was going to try to sell it to some like-minded-fool at MY upcoming yard sale, and was mad that he didn't run it by me first. He quickly apologized, but it wasn't enough for me. I usually don't take apologies well. I want a blood-atonement...flogging, etc.. He had had enough, and brought it up to me during this conversation. I will spare you the details, but the jest of it was that he didn't like being made to feel bad, and didn't think he deserved it. I felt that he did deserve to feel bad, and it went from bad to worse, ending with me telling him that schizophrenics believe their reality and him making a strangling motion at me as he stomped out of the room. I think I went too far. As I was stewing in my pot of indignant-self-righteousness after he'd left the house, I got to thinking about what he'd said. Did I make people feel bad after they apologize? Why wasn't a simple apology good enough? What childhood memory could I pick out to explain my demented character flaw away? I drew a blank... C-R-A-P. I have learned the hard way that my children are self-floggers. I don't need to make them feel bad for any sins committed, because they heap the guilt on themselves. They don't have Jiminy Cricket sitting on their shoulders, they have the eighth Biblical plague. Is it possible that Gavin has that same sense of shame? That he doesn't need my twenty lashings to drive the point home? No shock-treatment to prevent him from returning to his criminal activity?? What was my problem?? Cooking up the lentils, browning the trout, I knew he was right. ARGH....SIGH...HUMILITY PIE IN FACE. Dalton asked where Dad was. I told him that he was out, and that he'd be back. I told him that it was OK when parents disagreed, and that everything would always be OK. I don't think he bought it. When Gav came back from Costco (his form of therapy) Dalton bounded out the door, greeting him like a war hero. I hate that I just caused that unrest in my son. I caused him to feel unsafe. And so, a minute later, while Gav was changing Garrett, I popped my head in the room and said, "You are right about everything." He looked stunned. I need to go tell Dalton that I apologized to his Dad. I meant to do that, because I want him to see that big people screw up too...Hold on, I am going to do that right now....OK, better. Anyways, so the kids played outside. Gav threw the football with Dalton and his buddy. Shelby played at the neighbor's house, with her "pet" butterfly. We ate our dinner. Dalton had another mini-fit when he found out we were having lentils (his arch enemy of side dishes). He swallowed two bites- the required amount) this time without the drama of dry-heaves and water-chasers of last time. Good boy...only eight more times and he'll like them. We cut open a cantaloupe. The kids had slice, after slice on the porch. It began to rain...a wild rain, that came down in waves- pausing for minutes, and then repeating...a good spring rain. The Mama's And The Papa's played in the background. Then baths and pj's and a game of "Hunter". Gavin assumed his role as the Hunter, with Nerf gun in hand and killer baby bear (Garrett) at his side, while Shelby assumed the roll of "jack rabbit" (her favorite animal of the moment). Gavin shoots her with a Nerf bullet, then proceeds to drag her to the front room, where he puts a "sleeping medicine" in her mouth (candy pez) and ties her feet up with a rope. He covers her with a blanket and waits for the sleeping medicine to wear off. Shelby waits for a moment or two, and then like a little Houdini, unties the ropes and bounds off like a true little jack rabbit. That is when Gavin sounds the alarm that the jack rabbit has escaped, and sends his baby bear/hunting dog (Garrett) off to track down the rabbit's scent (Garrett LOVES this). Dalton is usually armed with his own Nerf gun during all of this, and continues to intermittently shoot Shelby with bullets for no rhyme or reason. After a few more rounds of this, with plenty of "tranquilizers"(Pez) administered, they do a game to find the remaining Pez, that Gavin has hidden in the front room, and then it's time for stories. 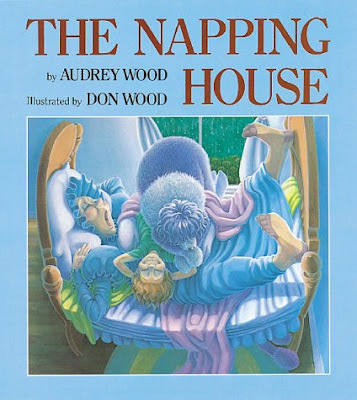 Shelby picks "The Napping House" http://www.audreywood.com/mac_site/catalog/catalog.htm (love the Woods) and Dalton picks listening to a song on his P.O.C. Ipod. Then it's rock-a-bye baby for me, followed by Ben and Jerry. Gav cleans up the kitchen and now I am off to "apologize" properly to him (IF you know what I mean ;) ) A day in my life.